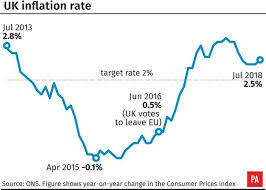 UK inflation rate rises for first time since November – Royal Times of Nigeria. UK inflation rose to 2.5% in July, after holding steady at 2.4% in the previous three months, as the cost of transport and computer games increased. It was the first jump in the Consumer Prices Index (CPI) measure since November and was in line with forecasts. Meanwhile the Retail Prices Index (RPI) measure of inflation fell to 3.2%. The Department for Transport uses the RPI figure to set the maximum annual increase for regulated rail fares. Despite the rise for CPI, wage growth is still outstripping inflation. On Tuesday, the Office for National Statistics said that average earnings, excluding bonuses, rose by 2.7% for the three months to June.